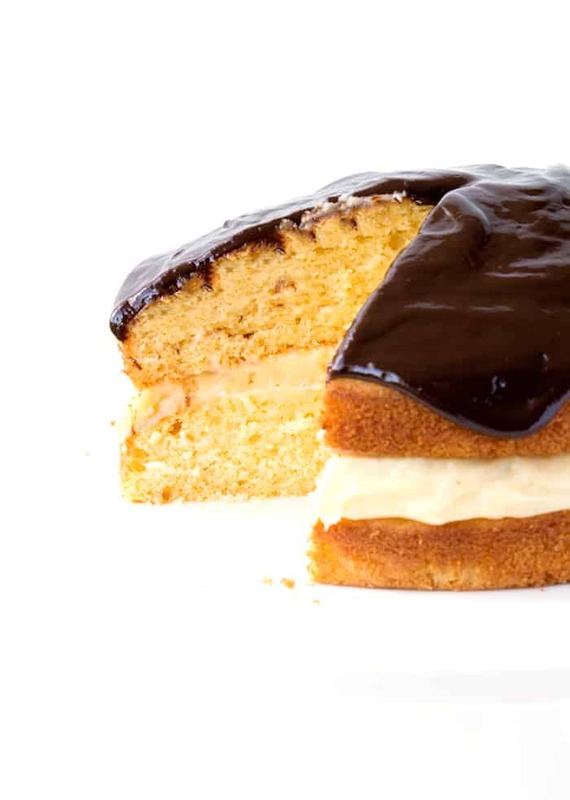 Boston Cream Pie for the WIN! This just might be the best cake EVER. 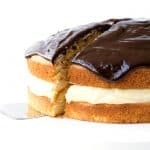 Two layers of soft and fluffy vanilla cake sandwiched with a thick homemade vanilla bean custard, all topped off with gooey dark chocolate ganache. It’s super indulgent but so different to any other cake, with traditional frosting swapped for creamy custard. 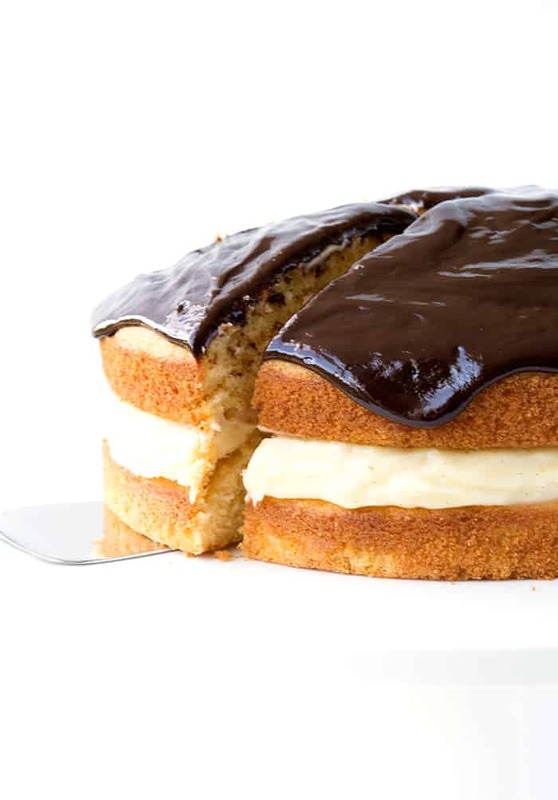 Boston Cream Pie – you’re AMAZING! 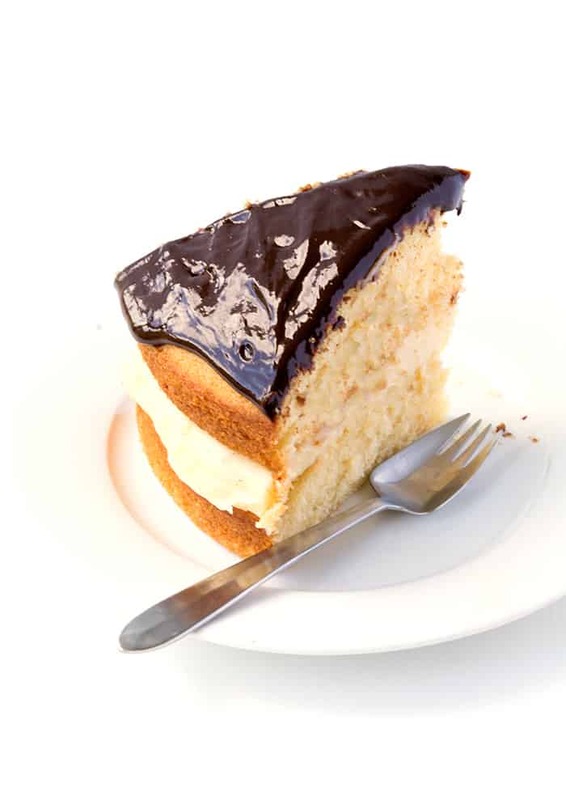 I only recently found out that Boston Cream Pie is actually a cake – not a pie at all! But cake or pie. I can tell you that this dessert is incredibly DELICIOUS. Who would have thought that custard and cake were the perfect match? You’re going to love this cake because not only does it look absolutely stunning, but it’s not too tricky to make. The vanilla cake is adapted from my Froot Loop Layer Cake recipe, but I added a few tablespoons of sour cream to the batter. It’s my secret weapon in vanilla cakes because it makes them unbelievably moist. And you’ll be pleased to know the vanilla custard is also easy to make. I used to feel intimidated about making custard from scratch because it sounded a little tricky with all those egg yolks and all the stirring, but now I wouldn’t go back. This thick and creamy custard tastes divine and comes together in about 10 minutes! Flavoured with vanilla bean paste, it has a strong vanilla flavour and holds its shape perfectly inside the cake – even when it’s cut. 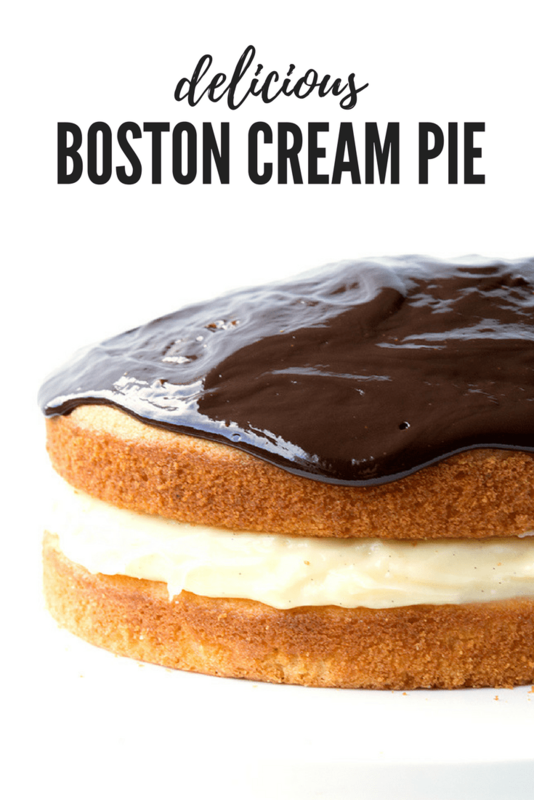 This was important because no one wants a Boston Cream Pie with vanilla custard squirting out the sides! 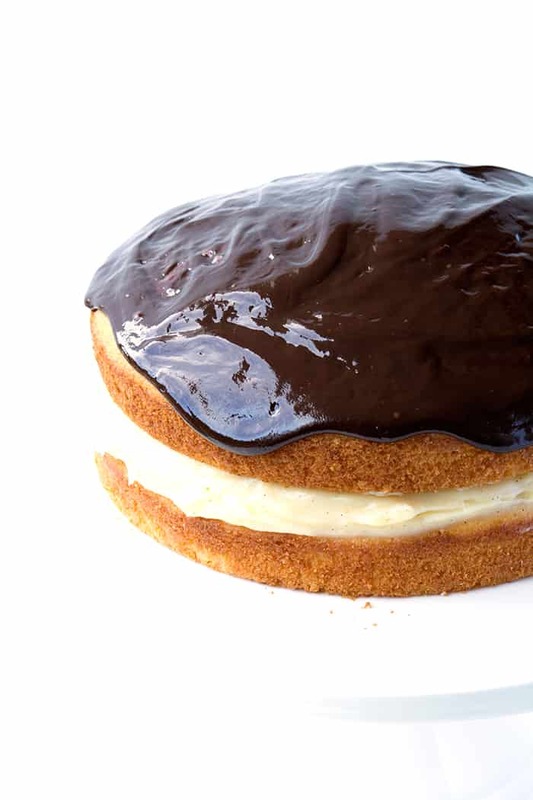 The final touch is a thick and glossy layer of chocolate ganache that can be made in the microwave. Simple but oh-so-delicious. 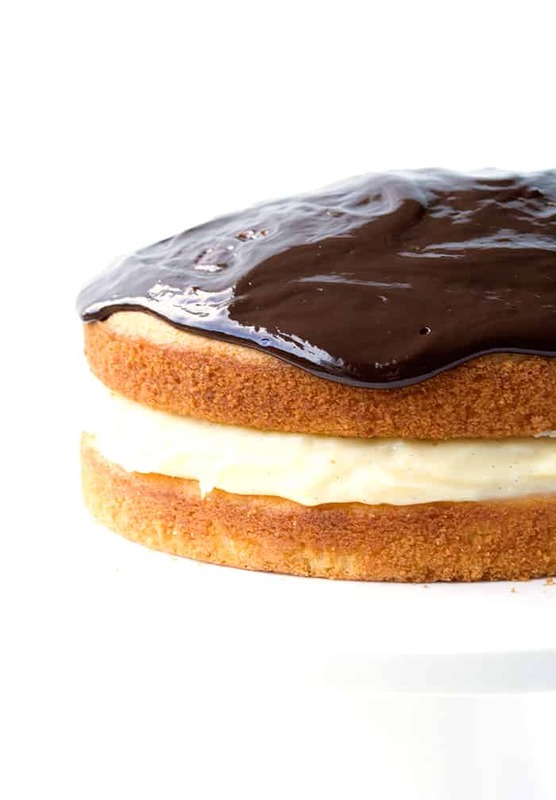 Soft and light vanilla cake paired with creamy homemade custard and drippy chocolate ganache – does it get any better? I hope you had a great weekend! We spent Friday night exploring the spectacular annual lights show here called Vivid. They do all kinds of creative light installations and even project visual art onto landmarks like the Opera House. It was very cool! 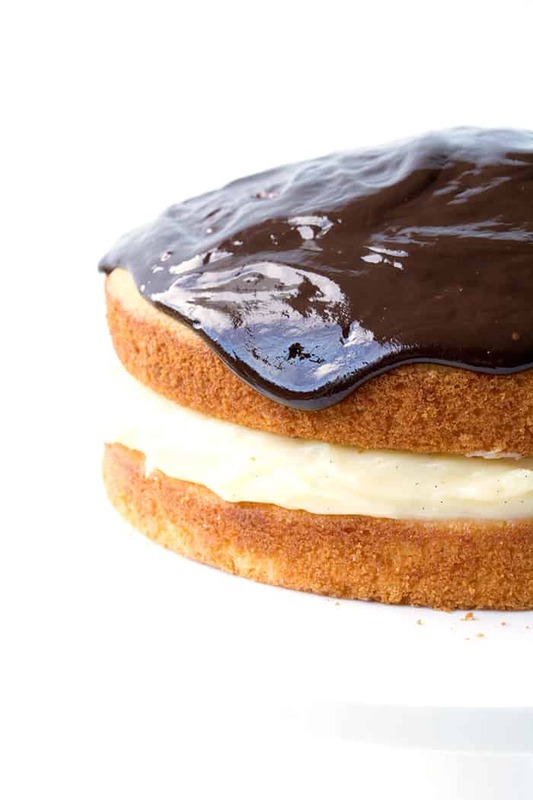 Two layers of vanilla cake sandwiched with a thick homemade vanilla bean custard, all topped off with gooey dark chocolate ganache. Grease and line two 8 inch round baking tins. Preheat the oven to 160 C (320 F). In a large mixing bowl, add the butter, sugar and vanilla and beat with an electric mixer until smooth and creamy. Add in the eggs, one at a time, and beat after each addition. Sift in the flour and baking powder. Add the milk and beat on a low speed until combined. Add sour cream and mix through. Divide the batter evenly between the two cake tins and bake in the oven for approximately 30 minutes or until golden on top. Carefully remove the cakes from the pans and set on a wire rack to cool completely. To make the vanilla custard, add 1 and 1/2 cups of milk to a medium saucepan and place on a low heat. In a separate mixing bowl, add your sugar, cornflour, egg yolks and the remaining 1/2 cup of milk and whisk together until smooth. Once the milk is hot to the touch (but NOT boiling), remove from the heat. Gently add a splash of the warm milk to your egg mixture and whisk. Then add a little bit more milk and whisk again. (By adding the warm milk slowly, you will prevent your eggs from scrambling). Then slowly stream in the rest of the milk into the side of the bowl, while whisking at the same time. Once you have add all your milk, pour the mixture back into the saucepan and place on a medium heat. Stir continuously until the mixture thickens, about 5 minutes or so. Then remove from the heat and add in the vanilla. Transfer to a large bowl. Cover with cling wrap, ensuring the wrap touches the top of the pudding (this will help to prevent it from forming a skin). Then refrigerate for at least two hours. To make the chocolate ganache, place your chocolate, broken into pieces, and cream into a bowl. Microwave for 30-60 seconds, until cream is hot to the touch but not boiling. Then gently whisk together until smooth ganache forms. To assemble, cut off the top of one of your cakes so it’s even and place on your cake stand or plate. Dump the custard on top and smooth out to the edges using a small spatula. Place your remaining cake layer on top (keep it domed). Then pour over your chocolate ganache. Cut and serve. This was so easy to make – everyone loved it! Oh so glad to hear that Josh! 2) Do NOT substitute potato starch for corn starch. Just don’t. Hi Monika, so glad you enjoyed this one! It’s one of my favourites. And I agree with your two points as well. Thanks for the lovely feedback! Holy. Drool. Cannot get over how good this looks… the filling!? UNREAL! Thanks Karly! That’s definitely my favourite part!